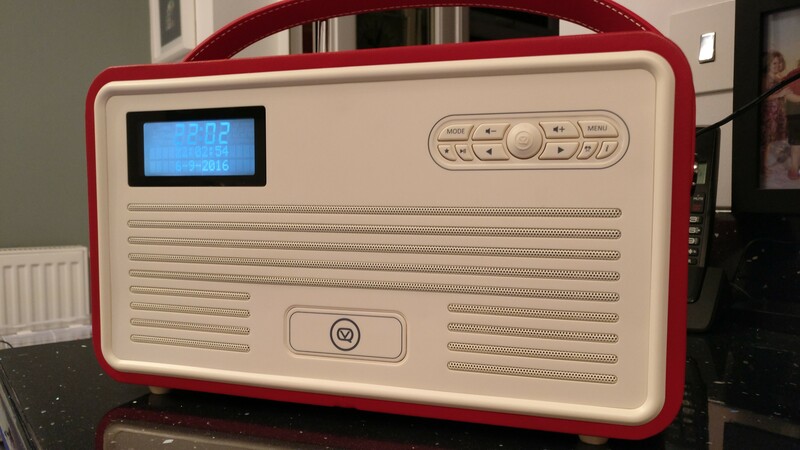 Are you in the market for a stylish designed retro looking DAB radio with some added features? 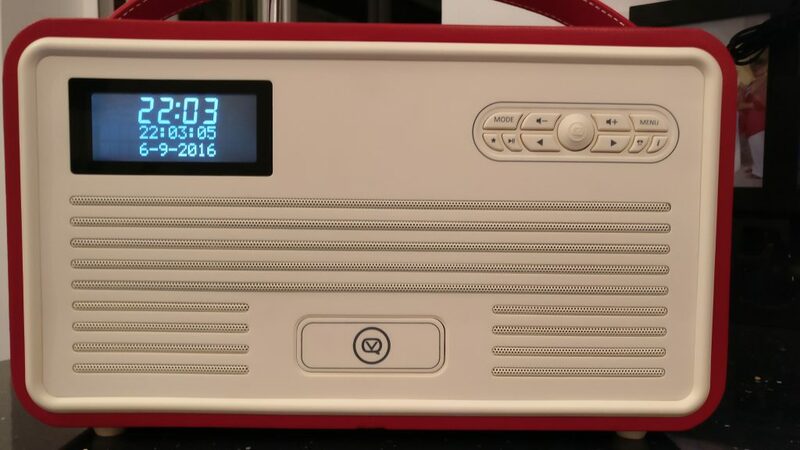 Well come on in and have a read of my review of the VQ MKII Retro DAB radio. 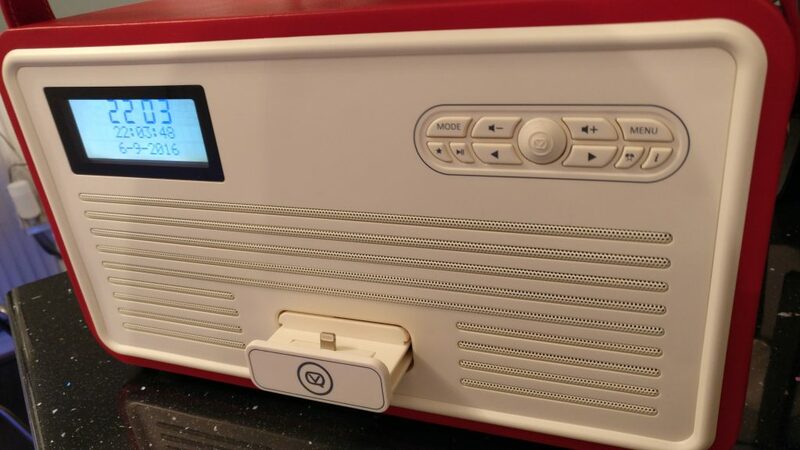 The VQ MKII is a multi-functional radio/speaker that is made to resemble a good old fashioned radio. The device is wrapped in leather (which is available in 11 colours) and comes with a leather carrying handle. The front is made of a cream plastic that resembles Bakelite. Behind the speaker grills at the front are dual 10W ultra-wide stereo speakers. On the front is a soft open close tray which is used as a stand/Lightning dock for a iPhone (possibly a iPad mini too, but I didn’t try that). Round the back of the unit is the extendable aerial, the battery housing, power port, a USB charge port, an AUX in port, headphone socket and on/off switch. I plugged in the VQ MKII and auto scanned the DAB radio channels. This took about a minute to find 98 DAB radio stations. The sound out of the VQ MKII Retro is simply amazing and it filled my kitchen with crystal clear music. I then placed the Retro into Bluetooth mode and paired it to my OnePlus 3. It streamed some media and again the sound quality was second to none. I then listened to some podcasts. There is a very, very good one released by this very site and again the spoken word coming out of the Retro was faultless. Unlike other Bluetooth speakers, there is none of that annoying hiss during quiet sections. The Retro is powered by both mains and a rechargeable 9.7 v battery pack, meaning that you can take your sounds with you. Unfortunately the battery pack is not included and is a £20 optional extra. The VQ MKII Retro is a stylish unit with amazing sound. It’s not just an easy-to-use DAB radio, but also has bonus features – being able to connect an iPhone or another Bluetooth device as an example. 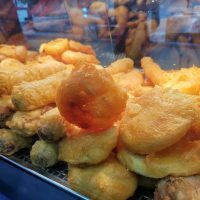 It’s well built, well designed and makes a good addition to any kitchen. It’s also portable with rechargeable batteries. The Retro is currently available from Amazon for £99, so if you’re in the market for a high quality DAB radio keep the Retro in mind as one of your choices. 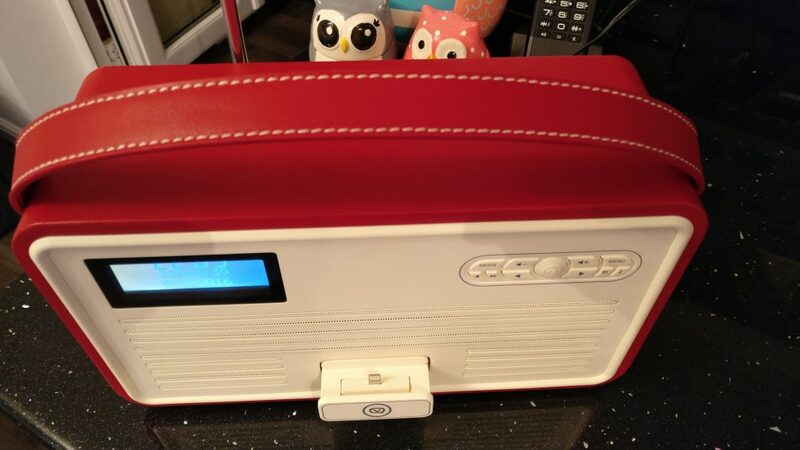 Are you in the market for a stylish designed retro looking DAB radio with some added features? Well come on in and have a read of my review of the VQ MKII Retro DAB radio. Good Points: Fantastic sound quality. Well built retro design. Available in 11 colours. Lightning Port Dock. Bluetooth Connection. 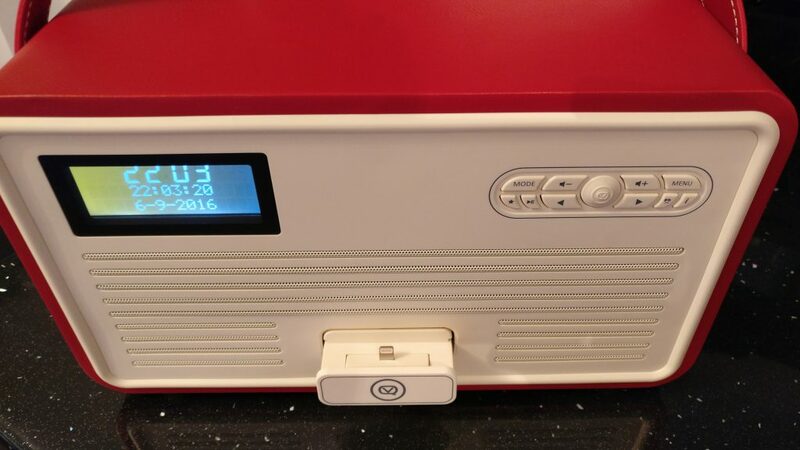 DAB/FM Radio. Mains/Battery. Bad Points: Battery Pack additional cost. Proprietary rechargeable battery pack. Design: The VQ MKII is a multi-functional radio/speaker that is made to resemble a good old fashioned radio. The device is wrapped in leather (which is available in 11 colours) and comes with a leather carrying handle. The front is made of a cream plastic that resembles Bakelite. Behind the speaker grills at the front are dual 10W ultra-wide stereo speakers. On the front is a soft open close tray which is used as a stand/Lightning dock for a iPhone (possibly a iPad mini too, but I didn't try that). 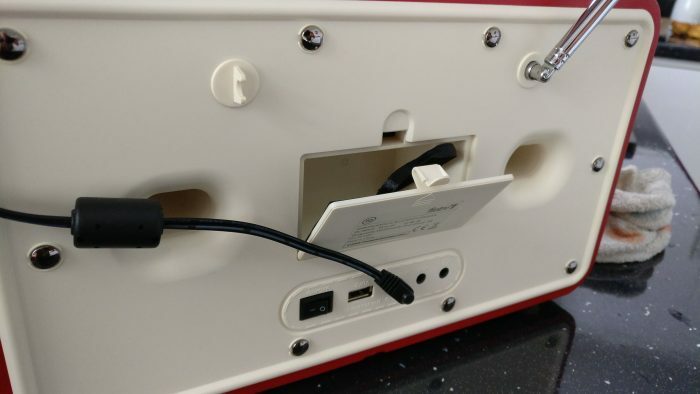 Round the back of the unit is the extendable aerial, the battery housing, power port, a USB charge port, an AUX in port, headphone socket and on/off switch. In Use: I plugged in the VQ MKII and auto scanned the DAB radio channels. This took about a minute to find 98 DAB radio stations. The sound out of the VQ MKII Retro is simply amazing and it filled my kitchen with crystal clear music. I then placed the Retro into Bluetooth mode and paired it to my OnePlus 3. It streamed some media and again the sound quality was second to none. I then listened to some podcasts. There is a very, very good one released by this very site and again the spoken word coming out of the Retro was faultless. Unlike other Bluetooth speakers, there is none of that annoying hiss during quiet sections. The Retro is powered by both mains and a rechargeable 9.7 v battery pack, meaning that you can take your sounds with you. Unfortunately the battery pack is not included and is a £20 optional extra. Conclusion: The VQ MKII Retro is a stylish unit with amazing sound. 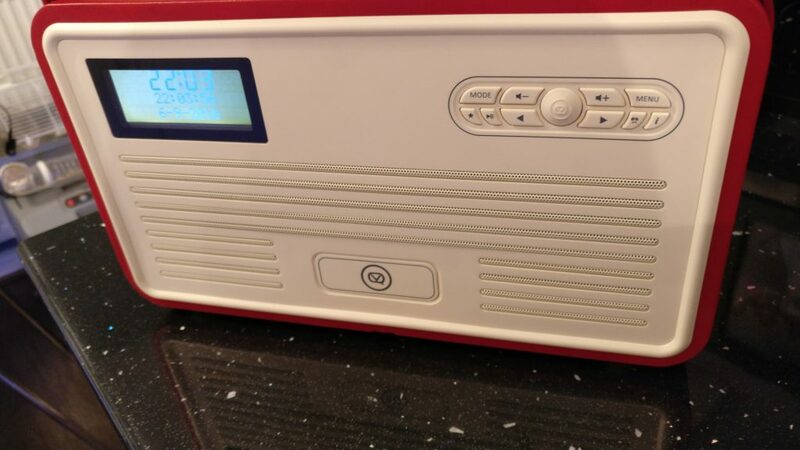 It's not just an easy-to-use DAB radio, but also has bonus features - being able to connect an iPhone or another Bluetooth device as an example. It's well built, well designed and makes a good addition to any kitchen. It's also portable with rechargeable batteries. The Retro is currently available from Amazon for £99, so if you're in the market for a high quality DAB radio keep the Retro in mind as one of your choices. Is the iPhone Upgrade Programme really worth it?